Wrist tendonitis is a common problem that arises due to overuse which causes injuries to the wrist tendons. This problem is characterized by tissue damage, swelling and pain. 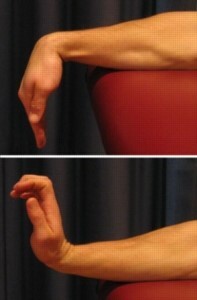 Two of the main tendons to the thumb pass through a tunnel located on the thumb side of the wrist. Any swelling in the tendons can cause increased friction and pain even with the slight movement of the thumb. It can be treated surgically or by non-surgical means such as Physiotherapy, splints, exercises or anti-inflammatory medication. 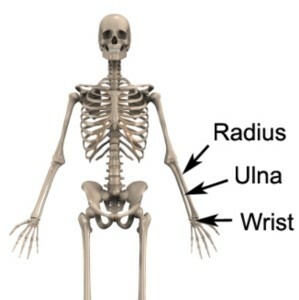 The forearm comprises of two long bones known as the radius and the ulna. These bones connect with several small bones known as the carpal bones forming the wrist. Many muscles of the wrist and hand originate from the radius and ulnar and cross the wrist to insert into the bones of the wrist, hand and fingers via the wrist tendons. 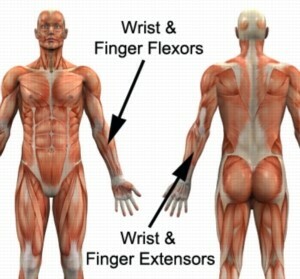 These muscles fall into two broad groups known as the wrist and finger flexors (which lie on the palm side of the forearm and wrist) and the wrist and finger extensors (which lie on the opposite side of the forearm and wrist). Generally, the wrist and finger flexors are responsible for bending the wrist and fingers forwards (e.g. making a fist), whilst the wrist and finger extensors are responsible for straightening the wrist and fingers and bending them backwards. Collectively, the muscles are responsible for gripping activity, movement of the wrist in all directions and general activities involving use of the wrist and fingers such as lifting, holding, carrying, writing, typing and pulling activities. During contraction of the muscles of the wrist, tension is placed through the wrist tendons. When this tension is excessive due to too much repetition, prolonged force or high force, damage to the wrist tendons may occur. Wrist tendonitis is a condition whereby there is damage, with subsequent degeneration, fiber disorganization / thinning and often swelling affecting one or more of the wrist tendons. This is usually due to gradual wear and tear associated with overuse, however it may also occur traumatically due to a specific incident. Wrist tendonitis most commonly occurs due to repetitive or prolonged activities placing strain on the wrist tendons. These activities may include sports such as gymnastics, golf or racquet sports as well as manual work such as carpentry, painting, chopping wood, bricklaying, repetitive use of a hammer or screw driver, use of vibrating machinery, gardening, sewing and knitting or working at a computer (i.e. excessive use of a mouse or typing). Wrist tendonitis may also occur from other activities involving forceful or repetitive gripping of the hand. It is common for patients to develop this condition following a sudden increase in force, frequency or duration of activities that place stress on the wrist tendons or due to a change in these activities. Occasionally, wrist tendonitis may develop suddenly. This can be due to a fall onto an outstretched hand, a direct impact to the wrist tendons or due to a forceful movement involving heavy lifting or a gripping force through the wrist. A history of wrist, elbow, shoulder, neck or upper back injury may increase the likelihood of a patient developing this condition. 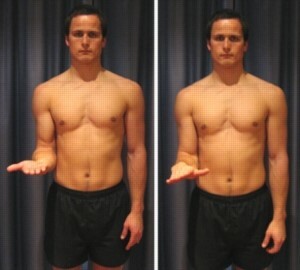 A thorough subjective and objective examination from a physiotherapist may be sufficient to diagnose wrist tendonitis. Further investigations such as an X-ray, Ultrasound, MRI or CT scan may be required to assist with diagnosis, rule out other conditions and assess the severity of the condition. With appropriate management and physiotherapy, most minor cases of wrist tendonitis that have not been present for long can usually recover within a few weeks. In more severe and chronic cases, recovery can be a lengthy process and may take more than 6 months in those who have had their condition for a long period of time. Early physiotherapy treatment is vital to hasten recovery in all patients with this condition. Begin this exercise with your forearm supported by a table or bench and your wrist and fingers over the edge. Slowly bend your wrist forwards and backwards as far as you can go without pain and provided you feel no more than a mild to moderate stretch. Repeat 10 times provided there is no increase in symptoms. Begin this exercise with your elbow at your side and bent to 90 degrees. Slowly rotate your palm up and down as far as you can go without pain and provided you feel no more than a mild to moderate stretch. Repeat 10 times provided there is no increase in symptoms.